Happy September Doodlebug fans! It might only be early September, but Fall is fast approaching and Thanksgiving will be right around the corner. When I saw the new Fall Friends collection, I was so excited, because not only is it full of Doodlebug cuteness, but it's perfect for both fall projects AND Thanksgiving too! For my post, I decided to stick to my favorite ... a mini album that doubles as a fall home decor project and a perfect way to save Thanksgiving memories. First of all ... can we all just agree that this little turkey is so stinkin' cute?! Love him, so he took center stage on the cover (he's a DoodlePop and he fits perfectly over his matching 4x4 card in the paper line). I also love the Mini Leaves and Acorn Die Cuts and the Bits of Fall Sprinkle Shapes. These added a fun pop of fall color to the bottom of my cover. I love Mr. Turkey so much he got to be on the first page too! I added a few border strips from the Fancy Frills stickers to this page also. Remember when I said that the Fall Friends collection mixes perfectly for a Thanksgiving theme too? 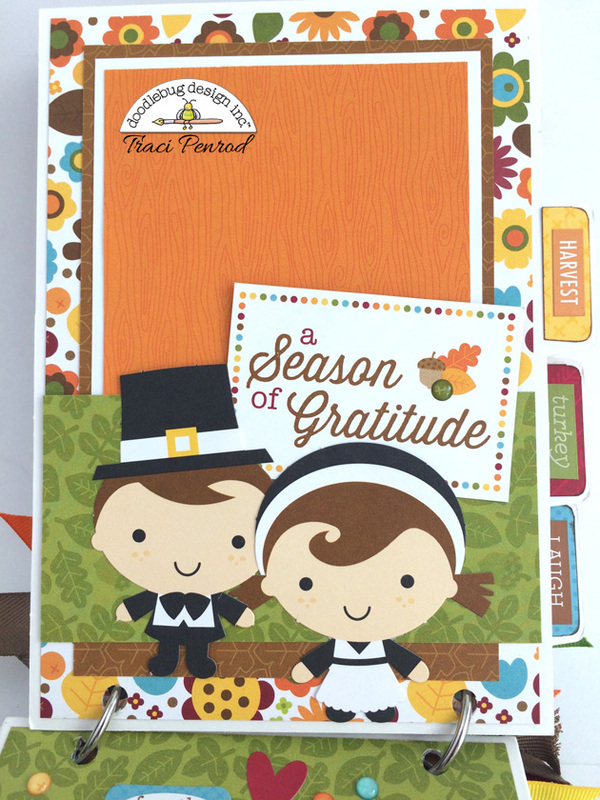 Well, Doodlebug is brilliant and in addition to the cute die-cuts I used on the cover, they made adorable Thanksgiving themed ones too. The pilgrim people are almost as cute as Mr. Turkey! Whenever I create a mini album (which you know is often), I love to add in the 3x4, 4x4, and 4x6 cut-apart cards that are part of the paper lines. For this page, I love the scene on this card paired with a scallop circle photo mat. Howdy pilgrim! I hope you've enjoyed checking out the Fall Friends collection in my mini today. Have fun crafting and I hope you'll visit my Artsy Albums website to check out more pictures of this album at www.artsyalbums.com. This is so cute Traci!!!! So so cute, Traci! Love all the details!!! HOW super DARLING is this???? I will tell you - it is STUPENDOUSLY, AWESOMELY DARLING!!! So cute!!! Traci really know how to make Doodlebug products shine in mini albums!!! She Aced this!!! Ha Ha thanks Mendi!! It's easy to make cute stuff when Doodlebug products are so stinkin' adorable!! So cute, you have done a fabulous job with this cute line. LOVE this mini album!! !